Harris, Ronald Irvin “Ron” Age 62, of Flint (formerly of Fenton) passed away on Wednesday, January 23, 2019. Funeral services will be held at Sharp Funeral Homes, Fenton Chapel, 1000 Silver Lake Road, Fenton. Family visitation will be held from 10-11 AM and then 11 AM until the time of service at 3 PM Friday, February 1st. Ron was born February 15, 1956, in Manistique, the son of Raymond and Peggy (Tatrow) Harris. He was a 1974 graduate of Fenton High School and retired from the City of Fenton DPW. Ron was a lover of cars, music, and history. He also loved road trips with his wife Sherry and spending time with his family, especially his children and grandchildren. 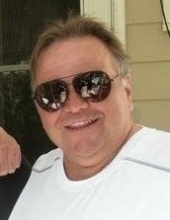 Ron had a zest for life and was an excellent story teller, a friend to all who knew him, and everyone’s favorite uncle. Surviving are: wife, Sherry Harris; children, Ronald II “Ronnie” (Nikki) Harris of Detroit, Rachael Harris of Flushing, Stevi Atkins (Stacie Grandstaff) of Flint, and Christopher Ford of Flint; grandchildren, Madison, Cameron, Brody, Brennan, and Brady; brothers, Ray and wife Kim Harris of Flint, and Nathan Harris of Texas; sister, Jennifer and husband David Chambers of Garden; and many nieces, nephews, and special friends. To send flowers or a remembrance gift to the family of Ronald Irvin Harris, please visit our Tribute Store. "Email Address" would like to share the life celebration of Ronald Irvin Harris. Click on the "link" to go to share a favorite memory or leave a condolence message for the family.